As soon as I laid eyes upon this fabby mix of color, I just knew I wanted to create a baby card! Don't get me wrong, the traditional pink and blue are great to welcome the "wee ones" into the world. But this combo seemed like such a fresh and modern take. I love it! It also inspired me to dust off (REALLY, dust off) a set in my stampin' arsenal, Animal Stories. I don't think I have used this one in over a year...yikes! You can also see a itty-bitty preview of a new item from the SU! Summer Mini Catalog on this one. Hooray for Baker's Twine!! Thanks so much for popping by today to visit! 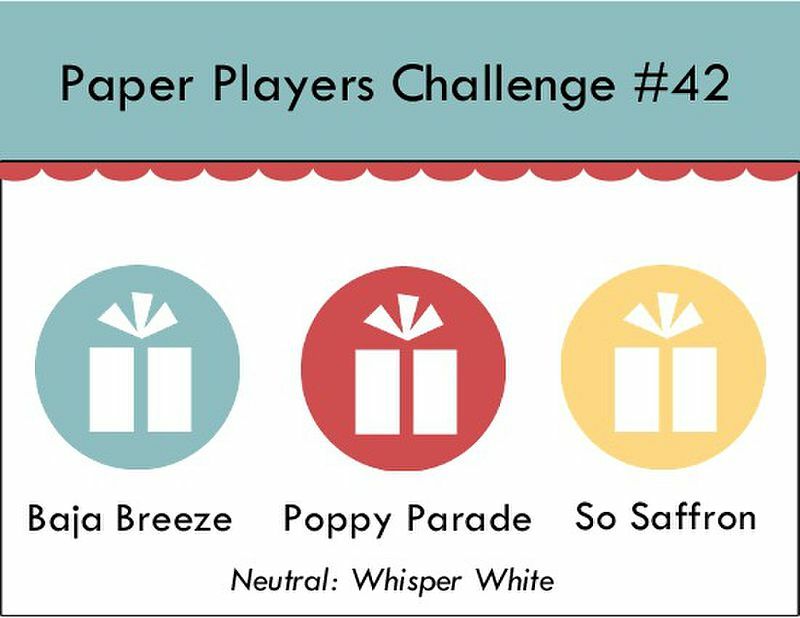 I sure hope you will play along with this fun, color challenge at The Paper Players, this week. Click the link to hop on over to the site! We can't wait to see what you create! Before you go, please leave me a comment to say hello. I really appreciate you taking time out of your day to visit. Have a fantastic day out there! Accessories: Scallop Trim Border punch, Sugno Uni Ball White gel pen, Ticket Corner punch, 1 3/8" x 5/8" Oval punch, 1 3/4" x 7/8" Oval punch, Basic Rhinestones, Baker's Twine (New Summer Mini catty), Perfect Polka DOts Embossing folder, Bone Folder, Stamp-a-ma-jig and Stampin' Dimensionals. This is such a cute baby card, Anne Marie !! Love the colors and these little wale....lovely. This is adorable! Reminds me that I need a one-year-old's birthday card---TODAY!!! This might just be the ticket! I just love all the fabulous detail in this card and the color combo is tres chic! The inside takes the card over the top and will surely impress the receiver. I love the triple whale and such cute colors for a baby card. Love the little details you always do.. the dots (so cute), the twine, the ticket corner punch. All so so cute. I can't get over how the same colors look so TOTALLY different by how the DT used them. These might be a brand new FAV color combo for me. Hugs. That IS a nice colour combo and a refreshing change from the traditional blue & pink. Great job, AM! Very cute Anne....and I like that color combo too! Great card. This is so stinkin' cute! Great design! so precious!! I agree...great color combo for a baby card! Love the use of layers and embellishments too! This is just adorable! Bling was the perfect choice! I love the layout, too! Of course, the texture is delicious! this is just too cute! I love that little whale. Great card! Love the way you did the inside of the card too! i think I am going to have to use these colors in a card today. Thanks for the inspiration. Hey AM! I love how you used the DSP and it peeks out of the sides on the front! Also, your whales made me giggle...love their eyeballs! Realy fun! Great way to use the colours! So happy you are on the PP team with us!!! Love this baby card with its nontraditional colors!! So cute!! Oh, what a precious baby card! I love your color combo. 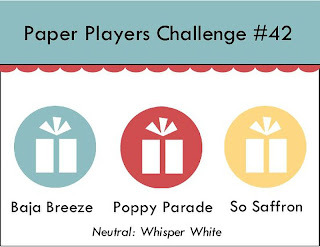 I did not immediately think about a baby card when I saw this color challenge, but you're absolutely right! It's a totally rockin' baby card! And what baby (or baby's mama) wouldn't appreciate a little bling? Such a sweet card & love the extra detail to the inside. Makes it even more special! Another terrific creation! The inside is as beautiful as the outside!!! This is so darling, and such a creative use of the colors! I love your layout and the strip of DP that packs a punch. Beautiful! Adorable card!! Love it! Love it! Love it! !